Come Get Your Picture Take With Penn States ONLY Heisman Trophy Winner Life Size Bobble Head. 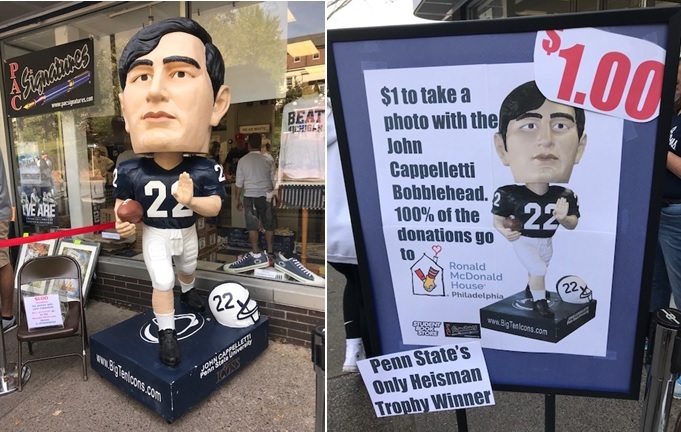 The John Cappelletti Life Size Bobble Head Will Be On Display In Front Of The BIG BLUE Student Book Store Located At 330 E. College Ave. Downtown State College PA. Saturday’s During All Penn State Home Games. Donations Will Be Accepted And All Proceeds Will Benefit The Philadelphia Ronald McDonald House. This entry was posted on Wednesday, October 18th, 2017 at 11:18 am	and is filed under News. You can follow any responses to this entry through the RSS 2.0 feed. You can leave a response, or trackback from your own site.